Hardball ammunition for the .45 ACP from the vintage wartime 1911’s to the newest sub compact polymer framed pocket pistol that fires the time tested round. This is the quintessential .45 Auto round and the reasons one might want to choose it are many fold. The premium reliability in feeding and extraction that hardball 230 grain .45 ACP ammunition can claim is just one aspect of the equation. The hard hitting projectile that recoils less with muzzle flip and more with that slow rolling backward push that the .45 is so famous for. That’s another reason to love this load. The fact that this is Federal’s rendition of the classic hardball ammo speaks volumes about this particular load’s reliability and QC at the factory. The somewhat mundane ballistic numbers that this round offers doesn’t detract from the likability of the round, nor do they tell the whole story. Clearly, 830 feet per second velocity out of the barrel and 350 ft. lbs. of energy is enough to cycle any .45 ACP firearm or bang any steel target like it’s meant to. This is the legitimate hardball ammunition in .45 Auto from Federal in all its 230 grain Full metal jacket glory. Got 1,000 rounds and tried to shoot them all, but still have a few left. No misfires! Super quick shipping, too!! 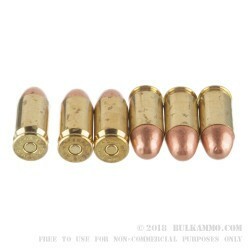 Q: On average how many reloads would you give this ammo before there is too much Brass expansion? A: This is heavily dependent on your loading procedures and how hot you make your handloads, but it would be reasonable to expect 5 to 10 reloading cycles out of this brass. Q: The ammunition is advertised as FMJFN but all the pictures show a traditional round nose bullet design. Is this in fact a full metal jacket flat nose design bullet? A: This ammo is loaded with a round nose bullet. Q: Would you recommend this as a practice load for Federal Hydroshock? 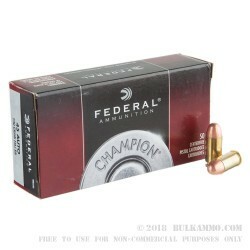 A: Yes, this Federal Champion .45 would be a good practice load for those who carry with Federal Hydra-Shok ammo. It is loaded to similar velocities and will offer comparable amounts of recoil. Q: How can S&W make a revolver that shoots both .45acp and .45lc, and has this ever been done before? A: Ingenuity in engineering, to put it simply. There have been similar concepts in the past. The most interesting was the Medusa, which could fire 25 different types of 9mm and .38 caliber ammo. Q: Are these bullets fully re-loadable and where are Federal ammo made? 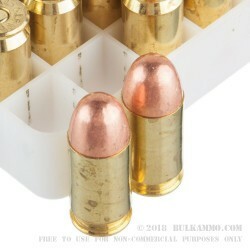 A: While the brass cases used for this Federal .45 ACP ammunition are reloadable, it is unlikely that you would be able to recover and reload the projectiles/bullets themselves. This ammunition is made in the United States.